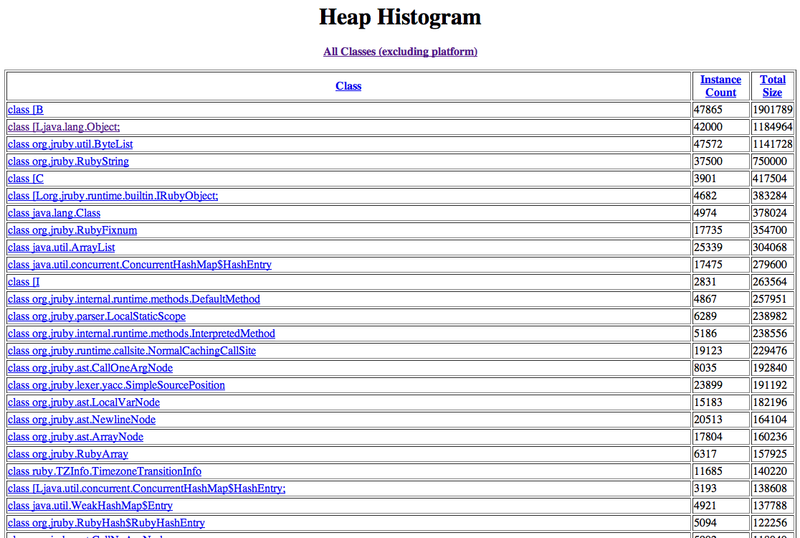 Let's go with what we know and view the heap histogram again. 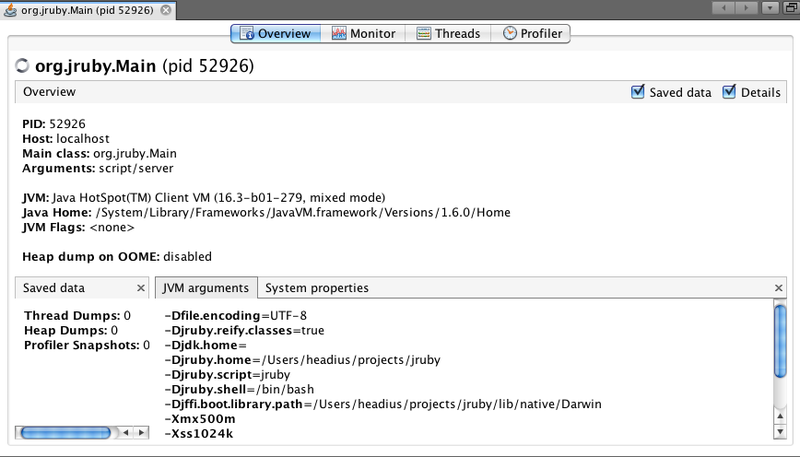 Here we can see that there's lots of objects taking up memory, and they're a mix of JVM-native types, JRuby implementation classes, and actual Ruby classes. 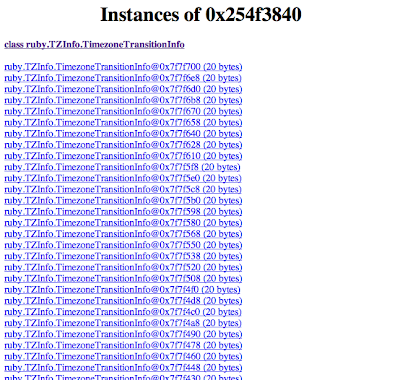 In fact, here we can see our friend TZInfo::TimezoneTransitionInfo again. Let's click through. Pretty mundane stuff so far; basically just information about the class itself. But you see at the bottom of this screenshot that we can go from here to viewing all instances of TimezoneTransitionInfo. Let's try that. Ahh, that's more like it! Now we can see that there's a heck of a lot of these things floating around. Let's investigate a bit more and click through the first instance. Now this is some cool stuff! We can see that the JVM class generated for TimezoneTransitionInfo has three fields: metaClass, which points at the Ruby Class object; varTable, which is an array of Object references used for instance variables and other "internal" variables; and a flags field containing runtime flags for the object, like whether it's frozen, tainted, and so on. We can see that this object has no special flags set, and we can dig deeper into those fields if we like. We'll skip that today. Moving further down, we see a few more amazing links. First, there's a list of all references to this object. Ahh, now we can start to investigate why they're staying in memory, even though we're not using them. We can even have jhat show us the full chains of references keeping these objects alive; a series of objects leading all the way back to one "rooted" by a thread or by global JVM state. And we can explore the other direction as well, walking all objects reachable from this one. This is only a small part of what you can do with jmap and jhat, and they're so simple to use it feels almost criminal. But what if we want to inspect an application while it's running? Dumping heaps and analyzing them offline can tell you much of the story, but sometimes you just want to see the objects coming and going yourself. Let's move on to VisualVM. 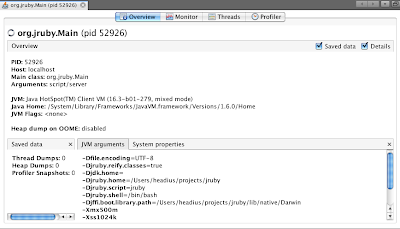 VisualVM spawned out of the NetBeans profiling tools. One of the biggest complaints about the JVMs of old were that all the built-in tooling seemed to be designed for JVM engineers alone. Because Sun had the foresight to build and own their own IDE and related modules, it eventually became a natural fit to pull out the profiling tools for use by everyone. And so VisualVM was born. 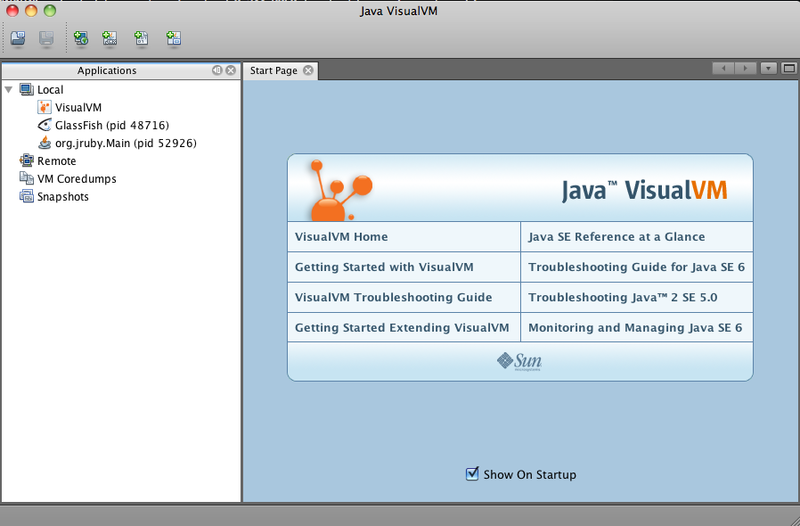 On most systems with Java 6 installed, you should have a "jvisualvm" command. Let's run it now. 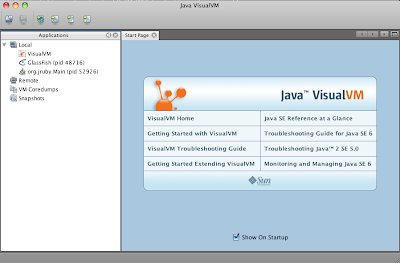 When you start up VisualVM, you're presented with a list of running JVMs, similar to using the 'jps' command. 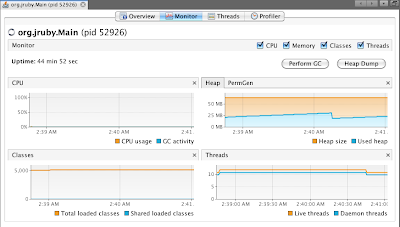 You can also connect to remote machines, browse offline heap and core dump files, and look through memory and CPU profiling snapshots from previous runs. Today, we'll just open up our running Rails app and see what we can see. 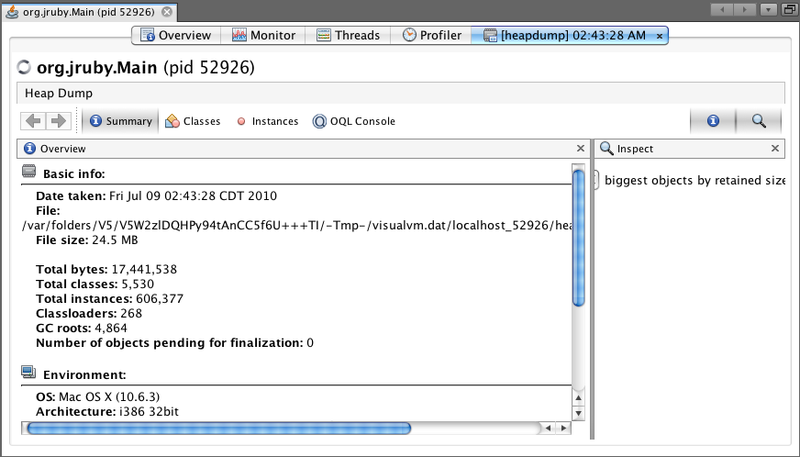 VisualVM connects to the running process and brings up a basic information pane with process information, JVM information, and so on. 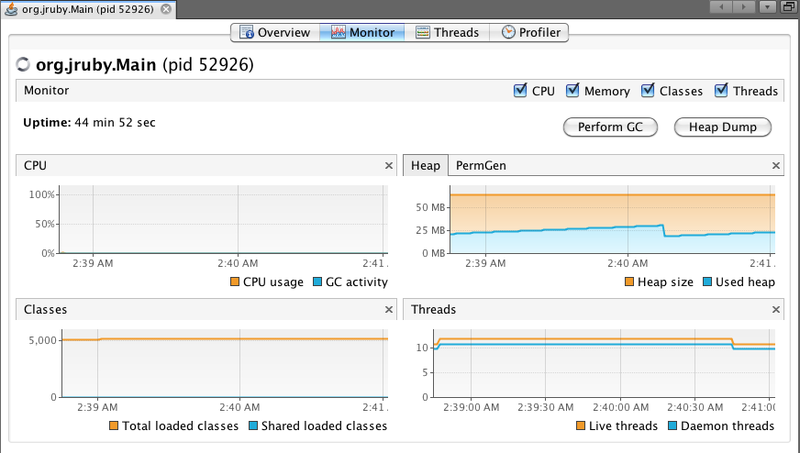 We're interested in monitoring heap usage, so let's move to the "Monitor" tab. Already we're getting some useful information. This view shows CPU usage (currently zero, since it's an idle Rails app), Heap usage over time, and the number of JVM classes and threads that are active. We can trigger a full GC, if we'd like to tidy things up before we start poking around. But most importantly, we can do the jmap/jhat dance in one step, by clicking the Heap Dump button. Tantalizing, isn't it? 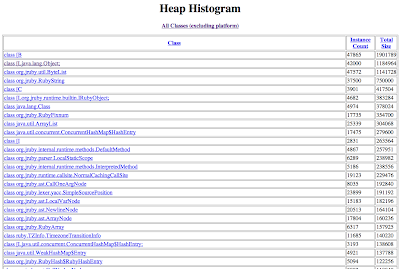 Initially, we see a basic summary of the heap: total size, number of classes and GC roots, and so on. 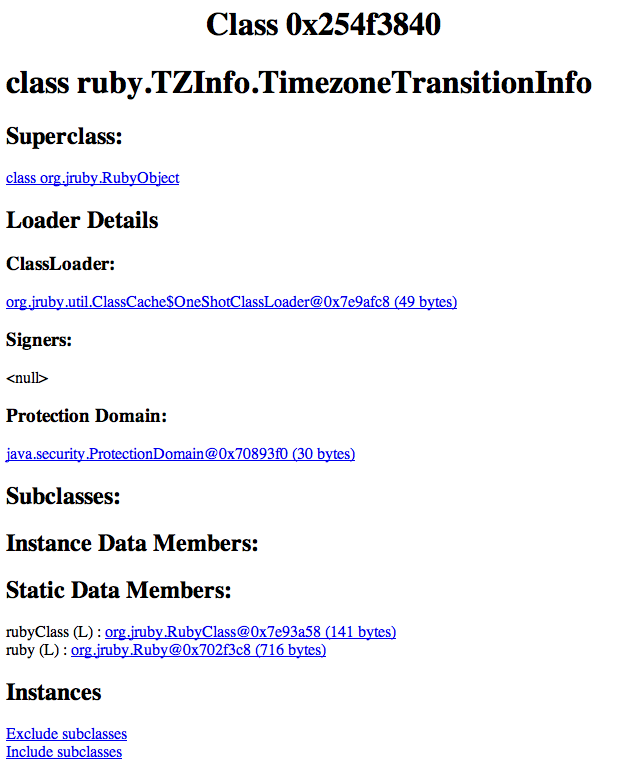 We're looking for our friend TimezoneTransitionInfo, so let's look for it in the "Classes" pane. Ahh, there it is, just a little ways down the list. The counts are as we expect, so let's double-click and dig a bit deeper. Here we have a lot of the same information about object instances that we did with jhat, but presented in a much richer format. Almost everything is active; you can jump around the heap and do analysis that would take a lot of manual work very easily. Let's try another tool: the Retained Size calculator. Because our JVM tools see all objects equally, the reported size for a Ruby object on the heap is only part of the story. There's also the variable table, the object's instance variables, and objects they reference to consider. Let's jump to a different object now, Gem::Version. We don't want to have to scroll through the list of classes to find ruby.Gem.Version, so let's make use of the Object Query Language console. With the OQL console, you can write SQL-like queries to retrieve listings of objects in the heap. 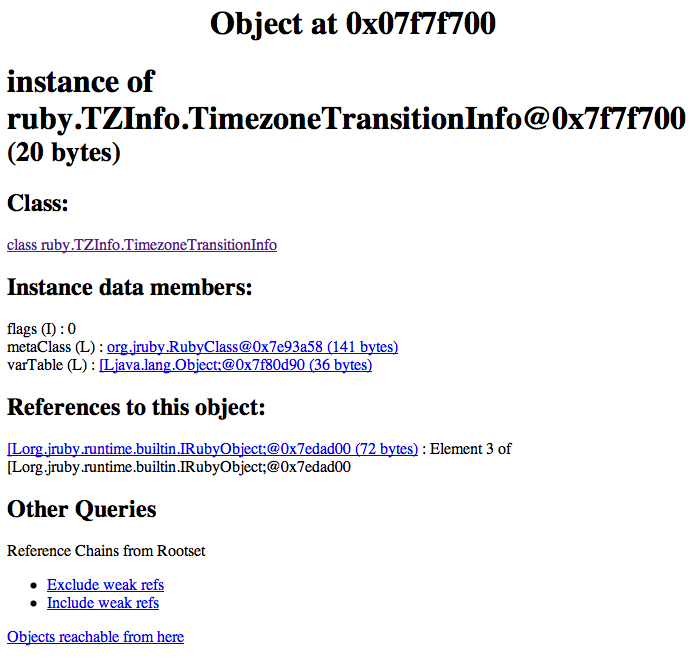 We'll search for all instances of ruby.Gem.Version. The query runs and we get a listing of Gem::Version objects. Let's dig deeper and see how much retained memory each Version object is keeping alive. Clicking on the "Compute Retained Sizes" link in the "Instances" pane prompts us with this dialog. We're tough...we can take it. So it looks like each of the Version objects take from 125 to 190 bytes for a total of 19400 bytes, most of which is from the variable table. What's in there? Ahh...looks like there's a String and an Array. And of course we can poke around the heap ad infinatum, into and out of "native" JRuby and JVM classes, and truly get a complete picture of what our running applications look like. Now you're playing with power. This is obviously only the tip of the iceberg. 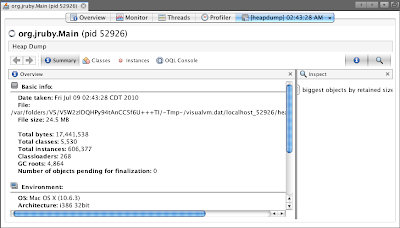 Tools like Eclipse Memory Analysis Tool include features for detecting leaks; VisualVM and NetBeans both allow you to turn on allocation tracing, to show where in your code all those objects are being created. There's tools for monitoring live GC behavior, and many of these tools even allow you to dig into a running heap and modify live objects. If you can dream it, there's a tool that can do it. 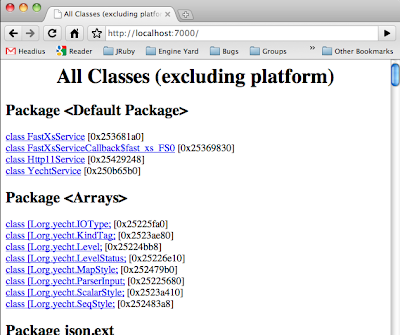 And you get all that for free by using JRuby. 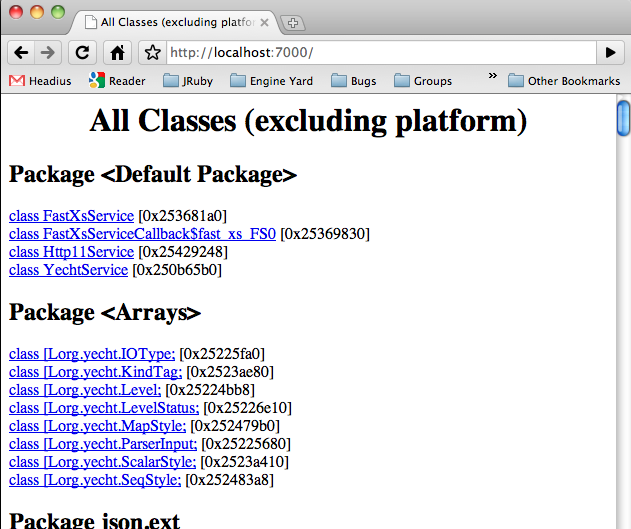 If you'd like to play with this, it all works with JRuby 1.5.1 but you won't get the nice JVM classes for Ruby classes. 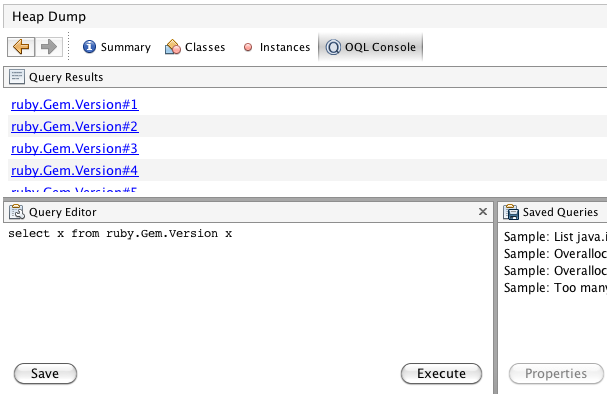 For that, you can pull and build JRuby master, download a 1.6.0.dev snapshot, or just wait for JRuby 1.6. And if you do play with these or other tools, I hope you'll let us know and blog about your experience! In the future, I'll try to show some of the other tools plus some of the CPU profiling capabilities they bring to the table. 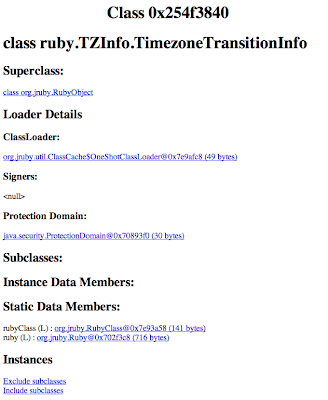 For now, rest assured that if you're using JRuby, you really do have the best tools available to you. Will a Ruby class be provided so that we can see this sort of stuff from inside the process? Perhaps extend GC? Since all these tools are actually written in Java, it should be possible to do all this from Ruby. The trick is in the APIs to do it. I've looked into it before, and it's certainly possible...butI don't have the links in front of me. The sources are all available though, and a bit of googling will show how to do the same things jmap and VisualVM are doing...or to just use them as an API instead of an application. Thanks Charlie! I've been looking forward to this post.